World Reflexology Week is September 20th - 26th! I absolutely adore getting my feet worked on and with everything I have begun to learn about Eastern Medicine and Shiatsu Massage - I am excitedly researching a place to make an appointment to get a reflexology session. If anyone reading has a place they would like to suggest in the NYC area - Let me know! The Reflexology Association of Canada defines reflexology as: A natural healing art based on the principle that there are reflexes in the feet, hands and ears and their referral areas within zone related areas, which correspond to every part, gland and organ of the body. Through application of pressure on these reflexes without the use of tools, crèmes or lotions, the feet being the primary area of application, reflexology relieves tension, improves circulation and helps promote the natural function of the related areas of the body. 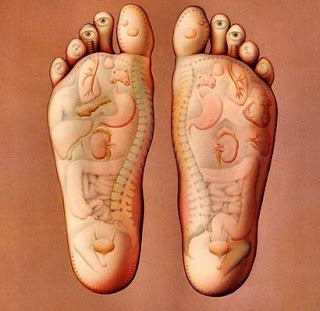 Reflexology works with zones and the flow of Qi - which is stongly based in Shiatsu beliefs. Yet according to some research I found by Paula S. Stone at the Massage Therapy Journal this practice has an international history. She cites that: In 2500 BC pictographs were found of reflex therapy in the tomb of the physician Ankhmahor in Saqqara, Egypt and in India reflex therapies support religious practices that integrate life, health, and spirituality. It wasn't until The Neurological Society of London, founded in 1885, provided a forum in which scientifically based neurological studies that included reflex action were conducted, presented, published and shared throughout Europe and the United States. This catapulted the practice of reflex therapy from folk medicine to the realm of science. Following these findings, Dr. William Fitzgerald in 1913 was credited to be at the forefront of the United States journey into zone therapy and reflexology. Reflexology Week is supported by the International Council of Reflexologists and if you are interested - their website has many promotional templates for practictioners to help spread awareness on this healthful practice. Like many of the Rub Down posts, this is the tip of the iceberg of knowledge to be gained! And I look forward to learning more! You have some time until the week of September 20th - 26th, so I encourage you to reap the benefits of a full body massage through the zones in your feet. I will be sure to let you know about my first experience with reflexology in an upcoming Spa Scoop post for the celebration of World Reflexology week!